BEIJING — Pakistan's new Prime Minister Imran Khan and China's President Xi Jinping were preparing to meet on Friday amid concerns over Pakistan's growing fiscal crisis and its ability to repay Chinese loans granted as part of Xi's Belt and Road initiative. Pakistan has taken out billions of dollars in loans from China in recent years for infrastructure projects, the terms of which remain largely undisclosed. China has in total pledged more than $60 billion to Pakistan in the form of loans and investments for roads, ports, power plants and industrial parks. In response to the debt crisis, Pakistan is seeking an emergency bailout loan of $8 billion from the International Monetary Fund, which plans to send a team to Pakistan to assess the situation. It is also seeking fresh loans from Saudi Arabia and China, discussion of which is expected to dominate Khan's visit. Further complicating matters, the United States, which strongly influences the IMF, has said it will not finance the repayment of Pakistan's Chinese loans. China and Pakistan refer to themselves as "all-weather friends," united in their rivalry against mutual neighbor India and entwined in a web of military, political and economic links. Pakistan has been among the most enthusiastic supporters of the trillion-dollar Belt and Road initiative, which seeks to re-establish China's former role as the Asian center of global trade by binding it to Europe, African, Southeast Asia and elsewhere through Chinese-financed projects. However, the fiscal crisis has put Khan's administration under early pressure, sparking public anger over the rising prices of basic goods. 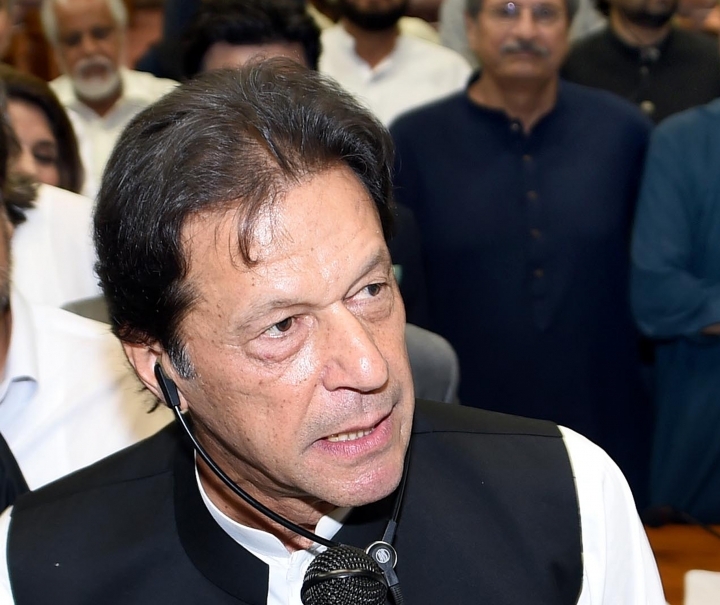 Khan had initially vowed to curb borrowing, but has proceeded with projects such as one to build 5 million public housing units and has predicted that Pakistan would soon overcome its economic woes. As an opposition politician, the former cricket star had questioned whether the partnership with China benefited Pakistan and promised the contracts would be made public. While that has yet to happen, the sides have begun reassessing some aspects of the Pakistan section of Belt and Road, known as the China-Pakistan Economic Corridor, including scaling back the development of Pakistan's Arabian Sea port of Gwadar. Agreements with Chinese power companies to supply much-needed electricity to energy-starved Pakistan have also been loudly criticized over the revolving debt costs to Pakistan. Other countries, including Malaysia, have also pulled back on Chinese-funded projects related to the Belt and Road initiative, and much concern has been raised over the case of Sri Lanka. That Indian Ocean island nation's government borrowed billions from China to build a port and airport, but when it was unable to make payments, signed an agreement giving a Chinese company an 80 percent stake and a 99-year lease on the failing port. Despite the questions raised, China has remained confident in the correctness of its approach to cooperation with Pakistan, with Foreign Ministry spokesman Lu Kang on Wednesday saying the economic corridor was a "mutually beneficial project between the two countries which plays an important role in improving people's livelihood and promoting economic development." Pakistan has said the project isn't a major contributor to Pakistan's debt or a cause of the "financial difficulties it faces currently faces," Lu said, adding that discussions will focus on "how to better drive forward with the building of the project."